A Boeing 727-200 Advanced in Boeing House livery. 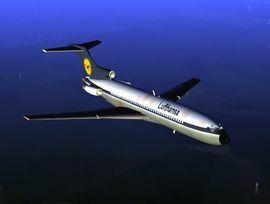 A Boeing 727-230 in Lufthansa livery. A Boeing 727-281 in Avensa livery. The first Boeing 727 flew in 1963 and for over a decade it was the most produced commercial jet airliner in the world. A total of 1,831 727s were delivered. The 727's sales record for the most jet airliners ever sold was broken in the early 1990s by its younger stablemate, the Boeing 737. Production ended in 1984. In August 2015, there were a total of 3 Boeing 727-100 aircraft and 66 727-200 aircraft in airline service. This page was last modified on 17 July 2017, at 20:09.